Considering that the deployment of TCR technology across the retail banking network is a capital intensive project, it should be considered as another "project" within bank’s investment initiatives portfolio management. Therefore it is necessary to assess this "project" significance in terms of Return–on–Investment financial indices. Leveraging on the full power and versatility of a TCR machine, a high ROI may be gained as a result of a wider transformation of the retail banking paradigm. By means of this introductory financial model we will observe that a banking project, targeted in TCR’s technology deployment across branches, may result in significant net present value for the bank, along the equipment lifecycle, with CapEx investment Internal Rate of Return being very attractive, challenging other corporate portfolio investment initiatives. This model formulates the parameters contributing in the overall operating cost, focusing in the elements that are going to have a delta "before" and "after" the TCR equipment deployment. This introductory model is intended for one branch, aiming to provide you with a first approach in your ROI opportunities. However in a real retail banking environment with hundreds of branches, several thousand ATMs and a growing number of interlinked businesses, it is quite challenging to determine your potential ROI using a more comprehensive "Operating & Financial" model. CubeIQ has developed more models, as it is described in the right column article, titled "ROI Estimation Models". The ECB decision on cash authentication, fitness and recycling triggers the retail banks interest to revisit their cash management model aiming to minimize direct and indirect costs. 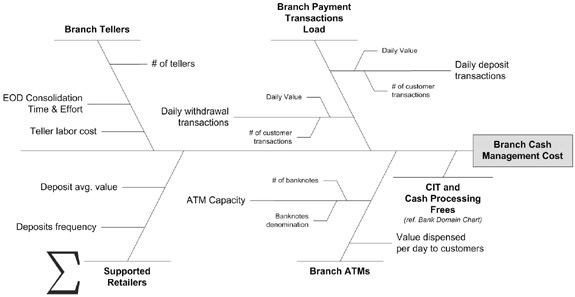 Cost elements such as –among other– the teller labor cost, outsourced services for Cash–In–Transit, Fitness and Sorting and ATM’s cash replenishment may be sliced or marginally eliminated by migrating from the traditional unassisted teller into a new teller paradigm supported by Teller Cash Recycling assistant machines. A bank project targeted in TCR’s technology deployment across branches may result in a significant net present value for the bank, along the equipment lifecycle, with CapEx investment Internal Rate of Return being equally attractive, challenging other corporate portfolio investment initiatives. The mission of retail banking business sector, within a large banking organization, is to address consumer customer, offering retail banking services, in accessible outlets, in proximity, across a geographical territory (re: country). The physical access points of the consumer are the bank branches where manned services are offered, and the automatic cash handling machines –such as ATM’s, cash dispensers, automatic bill payment systems– in the context of self–service transactions portfolio offering. The service level offered is directly related to the coverage, speed and easy access of consumed services. Thus, the number of branches and ATM’s network and the short waiting time in the branch tellers queue, are contributing decisively to the customer perceived service level. Inevitably, those parameters –such as the number of branches, ATM’s and tellers readiness– across the territory, are primary cost elements influencing the profitability of the retail banking business. Their efficient operation is associated to a secondary set of cost elements, such as the CIT and Cash Processing services, and last but not least the cost of floating capital spread across the network, in–between the National Central Bank and the retail banking access points (branches and ATM’s). There is certainly an operating cost reflected in a given Retail Banking Unit structure and operating model. It is expected that next to the introduction of TCR’s technology across the branches network, this cost will be lower. This saving in OpEx is a key determining factor in bank’s management decision to plan and deploy such a project. 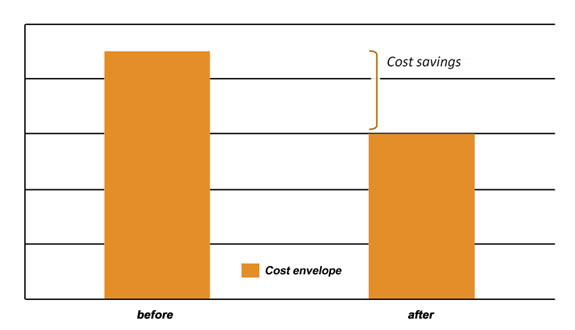 The cost savings assessment is an exercise based on the cost element parameters, as they were presented in the previous two paragraphs. Should all the specific parameters, are uniquely defined, then they enable the set–up of a simulated operating model for the branch, in the "as–is" situation. In the day–to–day execution of this model, deposits and withdrawals over the counter and via the ATM are recorded, along with the required cash handling activities involving CIT services. All those activities are sized appropriately and the associated activity based cost is estimated with adequate accuracy. This operating model is set–up and run once more, assuming the post–TCR deployment situation. The savings are estimated, as the delta between the two operating models OpEx calculation. Last but not least, the ROI indices, such as IRR and NPV, are calculated for a single branch, single TCR, deployment project. They are based on the TCR equipment cost and annual maintenance fees, as well as the annual OpEx savings. Retail banking investment in technology delivers in terms of productivity, quality of service and above all in customer satisfaction. However planning for a capital intensive project should reliably anticipate the return on the investment and the next day improved operating model. In a retail banking environment with hundreds of branches, several thousand ATMs and a growing number of interlinked businesses, it is quite challenging to determine the optimal deployment plan. The answer to this situation is reliable field data collection, analysis and determination of activity based costing model, and formulation of mathematical modeling and computer processing in identifying the optimal resolution; i.e. to what extend deploy next generation infrastructure technologies, and what would be the expected return on investing in such a project. For most merchants, couriers and banks, cash handling is still predominantly manual, but a growing number of institutions offer Remote Cash Control that sweeten the deal by providing provisional credit for deposits that are counted and validated by a "smart safe" that also provides audit trails for cash such as a TCR machine. More in our RCC dedicated microSite…. Please provide the data profiling the bank retail branch under assessment, for a contemplated TCR deployment project. Press the "Calculate" button below to view the results of the financial model calculation.